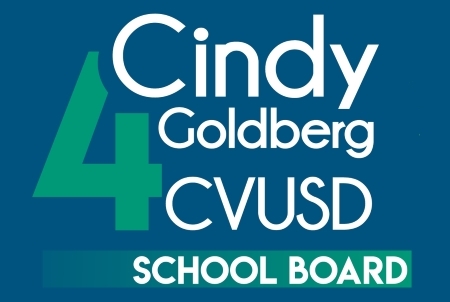 Cindy Goldberg announces candidacy for CVUSD Board of Education. Student and parent advocate launches school board campaign in the Conejo Valley. THOUSAND OAKS, Calif. (April 2, 2018) — Cindy Goldberg, executive director of the Conejo Schools Foundation and chairperson for the Conejo Valley Unified School District (CVUSD) District Advisory Council (DAC), has announced her intention to run for a seat on the CVUSD Board of Education (BOE) this fall. The election will take place on Tuesday, Nov. 6, 2018. Goldberg’s campaign will focus on her passion for and ability to advance measurable student-centered outcomes, her priority to cultivate a united team of board trustees whose leadership will foster collaboration and mutual trust among themselves and all stakeholders, and her emphasis on providing careful and transparent fiscal stewardship of district resources. Goldberg has a 15-year proven track record in the CVUSD, culminating from her experience in the classroom; involvement with both PTSAs and school site councils at the elementary, middle and high school levels; her roles on various CVUSD committees that focused on budget, homework policy and Career Technical Education (CTE); her position on the Measure I Campaign Steering Committee; and beyond. Currently, Goldberg works closely with the district on student-first policies through her position as the executive director of the Conejo Schools Foundation, a Conejo Valley-based nonprofit that mobilizes resources and partners with the community to protect, strengthen and grow quality educational experiences for all CVUSD students. In her role, Goldberg has contributed to the development and implementation of specific programs such as Cash for Classrooms, summer school, parent education workshops in conjunction with BreakThrough and beyond. Selected as one of The Thousand Oaks Acorn’s top 10 community members in 2017 for her work in the CVUSD, Goldberg’s main focus is always on the students. In addition, Goldberg serves as chairperson for DAC, a committee comprised of parent representatives from each of the schools who advise the BOE on matters related to educational programs, policies and procedures. In this capacity, Goldberg ensures that the council establishes and maintains intra-district communications and encourages the sharing of needs, accomplishments and activities in order to support a high-quality school system. Goldberg graduated from the University of California, Los Angeles with a bachelor’s degree in communications and a bachelor’s degree in history. A current CVUSD parent, she has three children, two of whom are CVUSD graduates. She resides in Thousand Oaks with her husband Gil, and has lived in the Conejo Valley since 2003.